With so much going on in the field of anticoagulation, our round-up of news in this area from the European Society of Cardiology (ESC) Congress, which took place in Rome, Italy, from 27th–31st August 2016, will ensure you keep up-to-date. 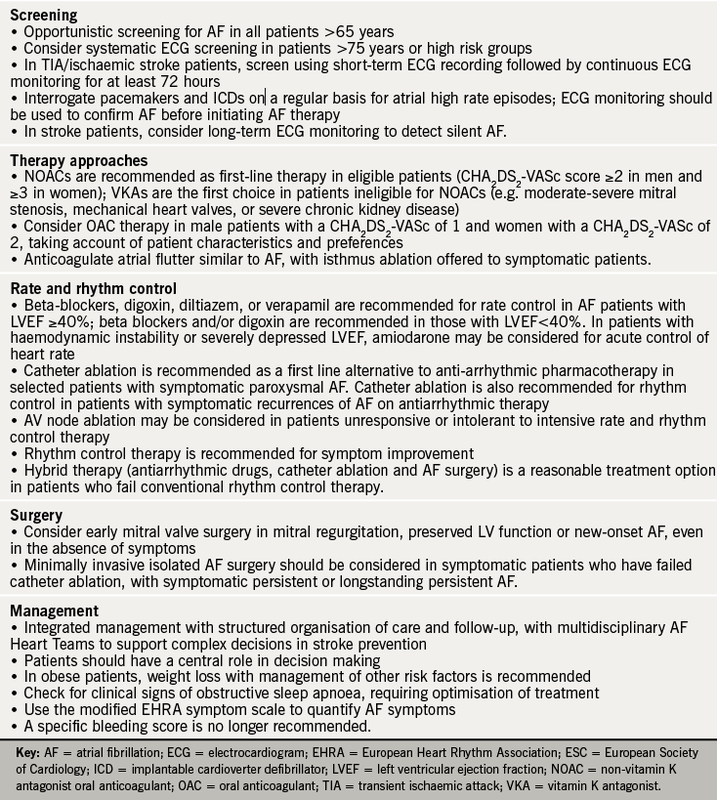 The first collaborative European Society of Cardiology (ESC) and European Association for Cardio-Thoracic Surgery (EACTS) Guidelines on Atrial Fibrillation (AF) were published at the start of the congress.1 These multidisciplinary guidelines focus on early detection of asymptomatic AF, recommending both opportunistic and targeted screening for all patients aged ≥65 years, or with stroke or transient ischaemic attack (TIA). In addition, the guidelines deal with long-term challenges in the management of AF patients, with recommendations on what to do when patients develop complications on anticoagulation, re-initiation of anticoagulation after a bleed, how to manage bleeds, and how to manage patients who have an ischaemic stroke on anticoagulation. Key new recommendations are summarised in table 1. Free smartphone tools are provided for patients with AF and their healthcare professionals via the ESC Pocket Guidelines App. Table 1. What’s new in the ESC-EACTS guidelines on AF? Professor John Camm (St George’s, University of London) speaks about the changes in the guidance in our podcast. The guidance, he says, has shifted in favour of real world data that has questioned the need for anticoagulant treatment in low-risk patients. This has led to patients often being unnecessarily anticoagulated, particularly women with a CHA2DS2-VASc score of 2, who are no longer recommended for anticoagulation (see figure 1). Analyses of registry data have shown that there is still much room for improvement in the use of anticoagulants in routine clinical practice. Analyses from the ongoing GARFIELD-AF (Global Anticoagulant Registry in the Field – Atrial Fibrillation) Registry* have shown that while anticoagulation usage has risen in patients with AF, many patients are now being given inappropriate anticoagulation. The Registry has shown that – contrary to international guidelines – 28% of high-risk patients (i.e. those with a CHA2DS2-VASc ≥2) are not receiving anticoagulation while 51% of very low-risk patients (i.e those with a CHA2DS2-VASc score of 0) are receiving anticoagulation. It has also been revealed that unexpectedly high proportions of patients tend to be prescribed the lower dose of NOACs. Phase 3 studies suggest that the proportion of patients prescribed low-dose NOACs is 49.7% for dabigatran 110 mg BID, 20.7 % for rivaroxaban 15 mg OD and 4.7% for apixaban 2.5 mg BID; real world data has shown that the proportions of patients prescribed low-dose NOACs is much higher – 53.7%, 24.5% and 35.5% for dabigatran, rivaroxaban and apixaban, respectively. Professor Camm talks about inappropriate anticoagulation in our podcast. “Factors beyond those in current risk scores appear to be influencing prescribing decisions on anticoagulation and improved risk stratification tools are needed to better identify truly low-risk AF patients,” said Professor Keith A A Fox (Duke of Edinburgh Professor of Cardiology, University of Edinburgh) at an industry press conference during the ESC. The GARFIELD-AF Score was developed using a machine-learning risk modeling approached based on analyses of data from 38,984 patients, enrolled in GARFIELD-AF between March 2010 and July 2015.2 A simplified model was also developed to facilitate web development. The performance of both models was compared with the CHA2DS2-VASc system in all patients and validated using an independent contemporary registry ORBIT AF. Compared to CHA2DS2-VASc, the performance of the GARFIELD-AF Score offered superior discriminatory value in predicting all-cause mortality, ischaemic stroke/systemic embolism, or haemorrhagic stroke/major bleed in low-risk patients (see table 2), and in predicting ischaemic stroke or major bleed in all patients. It is hoped the new GARFIELD-AF score will help doctors better assess the appropriateness of anticoagulation in low-risk patients. “The more comprehensive GARFIELD-AF Score includes multiple variables, beyond that of CHA2DS2-VASc, and this increased granularity will help to optimise the management of low-risk patients,” said Professor Fox. He also highlighted how a simplified version of the new scoring system has the potential to be incorporated into routine patient electronic record systems via web-based or mobile device applications, “enabling users to base treatment decisions on more precise and tailored values, as well as more complete estimates of risk based on multiple outcomes,” he added. Further risk factors, such as biomarkers, diabetes and heart failure, could also potentially be added into the new GARFIELD-AF tool in the future. As data from GARFIELD-AF registry grows, the GARFIELD risk score generated will become more and more accurate. If you want to find out more about the novel machine learning technique used and more about the GARFIELD-AF score, then watch our podcast from ESC. *GARFIELD-AF has now recruited over 57,000 patients (over five cohorts) with AF in more than 1,000 sites in 35 countries, who will be followed-up for a minimum of two years and up to eight years after diagnosis. The GARFIELD-AF Registry is led by an international steering committee led by the Thrombois Research Insitutite, London, and is funded by an unrestricted research grant from Bayer Pharma AG. Data from other risk scoring systems were also presented during the meeting, including the ENGAGE-AF TIMI score which is addressing how to identify those patients with AF who are likely to have adverse effects with warfarin and thus likely to benefit from NOAC therapy. Great anticipation surrounds studies presented at the Hotline sessions during the congress. This year there was much excitement about the ENSURE-AF and ANNEXA-4 studies chosen for presentation at the Hotline Preventive Strategies 2 session. ENSURE-AF (Edoxaban versus Enoxaparin/Warfarin in Subjects Undergoing Cardioversion of Atrial Fibrillation) included 2,199 patients with documented NVAF, who were randomly allocated to an open-label anticoagulation strategy, either edoxaban 60 mg/day (n=1,095) or warfarin with enoxaparin bridging (n=1,104), using early or delayed cardioversion. The edoxaban dose was reduced to 30 mg/day if patients had creatinine clearance 15-50 mL/min, low bodyweight (≤60 kg), and/or concomitant use of P‑glycoprotein inhibitors. There were no differences between the two treatment groups; mean age was 64.3 years, 66% male, mean CHA2DS2-VASc score was 2.6, and 72% had previously received anticoagulation. The primary end point was a composite of stroke, systemic embolism, myocardial infarction, and cardiovascular mortality, analysed by intention to treat. The primary safety end point was major and clinically relevant non-major bleeding in patients who received at least one dose of study drug. Patients were followed up for 28 days on study drug after cardioversion, as well as a further 30 days. Edoxaban treatment was associated with significant reduction in the primary end point, both for the intention-to-treat population (from 1.0% to 0.5%, odds ratio [OR] 0.46, 95% 0.12-1.43), as well as the group undergoing transoesophageal echocardiography, about half of the study group (from 0.8% to 0.3%, OR 0.40, 95% CI 0.04-2.47). The treatment effect was independent of anticoagulation status or any other factor. There was no difference between the two groups with respect to the primary safety outcome (16 events with edoxaban versus 11 with warfarin/enoxaparin), major bleeding (3 versus 5), clinically relevant non-major bleeding (14 versus 7), or any bleeding (32 versus 35). There was also a trend (although not statistically significant) towards a better net clinical outcome in patients in the edoxaban group versus those allocated warfarin/enoxaparin (OR 0.50, 95% CI 0.19–1.25). While the results were clearly favourable, the lead author Professor Andreas Goette (St Vincenz-Hospital, Paderborn, Germany) did acknowledge that the trial was not powered to demonstrate differences in efficacy and safety end points, as well as the wide confidence intervals for the end points. Despite these limitations, the trial findings suggest that it is probably safe to maintain patients on edoxaban if they are already on this therapy, and longer-term, the possibility of moving over to NOAC therapy in this challenging clinical setting. Preliminary results in the ongoing ANNEXA-4 study4 have shown that andexanet can rapidly reverse anti-factor Xa activity in acutely bleeding patients and is associated with excellent or good haemostasis in most. ANNEXA-4 (Andexanat Alfa, a Novel Antidote to the Anticoagulation Effects of FXA inhibitors) is the first study to look at andexanet in acutely bleeding patients. The study was not randomised for ethical reasons and interim results in 67 patients, who required urgent reversal of acute major bleeding within 18 hours of receiving either a direct or indirect factor Xa inhibitor, looks promising. There was much interest in real world data for oral anticoagulation at the meeting with analyses helping support the management of patients in routine clinical practice. Here, we report a selection of the data addressing some key issues. REVISIT-US (Realworld Evidence on Stroke prevention in patients with Atrial Fibrillation in the United States)5 was a retrospective analysis of the US MarketScan administrative claims database (January 2013–October 2014) of NVAF patients newly initiated on the NOACs dabigatran (n = 15,679, 10.3% on 75 mg twice daily [BID]), rivaroxaban (n=11,411, 17.3% on 15 mg once daily [OD]), apixaban (n=4,083, 15.5% on 2.5 mg BID), or the VKA warfarin. Patients in each group were propensity-score matched with warfarin users (mean age 70.7 years, 54% male, CHA2DS2-VASC score 3.46–3.48 across the groups). All three NOACs were associated with reduction in the primary composite end point of ischaemic stroke/intracranial haemorrhage (ICH) versus warfarin (significant for rivaroxaban, hazard ratio [HR] 0.61, 0.45–0.82, but non-significant for apixaban (HR 0.63, 0.35–1.12) and dabigatran (0.79, 0.62–1.02). Rivaroxaban and apixaban were also associated with significantly lower rates of ICH versus warfarin (by 47% and 62%), although the reduction with dabigatran (by 29%) was not significant. While the use of NOACs has been associated with significant reductions in haemorrhagic stroke, all-cause mortality and intracranial haemorrhage, one of the key concerns for the use of NOACs in the real world is the risk of bleeding complications. This was covered in a number of presentations at the 2016 congress. Most of the data related to retrospective analyses of large healthcare databases, with additional insights from nationwide studies and registries. Retrospective cohort data from the MarketScan and Medicare databases of NVAF patients newly prescribed NOACs showed a significantly lower risk of major bleeding with apixaban or rivaroxaban compared with warfarin.7 The analysis included data for 45,361 eligible patients: 15,461 (34%) initiated on warfarin, 7,436 (16%) on apixaban, 4,661 (10%) on dabigatran and 17,801 (39%) on rivaroxaban. Propensity score matching was used to balance patient baseline characteristics, co-morbidities, and co-medications. 12,625 warfarin-rivaroxaban patients (mean follow-up 177.9 and 162.7 days). 92 (rivaroxaban) versus 5.09 for the rivaroxaban-warfarin matched cohort. Patients were followed up until the earliest of OAC switch, bleeding event, last encounter or 180 days after first initiation of therapy. Bleeding was defined as any bleeding event during follow-up. The patient groups were comparable with mean age 67–74 years, >50% male and a mean CHADS2 score of 1.3–1.7. Compared with warfarin, there was significant (p<0.0001) reduction in bleeding risk with either apixaban (adjusted HR 0.811, 0.732–0.899) or dabigatran (HR 0.698, 0.621–0.785), although bleeding risk did not differ for rivaroxaban (HR 0.985, 0.911–1.066). Similar results were reported in elderly patients. Added to this, a Swedish post-authorisation study in a random sample of AF patients (761 of 78,022 treated in Stockholm county) showed no differences in the risk of major bleeding between rivaroxaban and warfarin.10 The data were analysed using both intention-to-treat (based on first prescribed drug) and on-treatment (drug on ≥80% of days) approaches. Major bleeding (i.e. fatal or requiring hospitalisation) was comparable for the two treatments in each analysis, despite the rivaroxaban group being on average older (mean age 75.1 versus 73.9 years), and at higher risk (mean CHA2DS2-VASc 3.35 versus 3.26). However, the risk of intracranial haemorrhage was significantly lower with rivaroxaban than warfarin (HR 0.63, 0.40–0.99). Finally, there was evidence from a nationwide Finnish study that bleeding complications are uncommon (<1%) in AF patients undergoing elective cardioversion (October 2011– December 2015).11 In total, 732 patients (mean age 63 years, 73% men, mean CHA2DS2– VASc score 1.8) underwent 893 procedures using dabigatran (57.9%), rivaroxaban (31.1%) or apixaban (11.0%). During the month follow-up period, the AF recurrence rate was 28.4%. There were two strokes, although each patient was receiving adequate NOAC therapy in the four weeks preceding the intervention, and four clinically relevant bleeding events in two patients each on dabigatran or rivaroxaban. Dr Amitava Banerjee (UCL Hospital and Barts Health) evaluated UK real world persistence, adherence and cross-over across the OACS using prescription data (April 2011–December 2015) from The Health Improvement Network for NVAF patients newly initiated on warfarin, rivaroxaban, dabigatran and apixaban.12 Edoxaban was not included as it was only approved in the UK in September 2015. The patient groups were comparable (mean age 75 years, 44% female, median CHA2DS2-VASc score 3.0). Persistence with NOACs at one year was less than that observed during a trial (76.3% with rivaroxaban, 78.8-79.3% with dabigatran, 74.7% with apixaban) highlighting the need for further evaluation of the tolerability and acceptability profiles of the NOACs (table 3). Marked geographical variations in outcomes have been shown in patients with newly diagnosed AF. Analyses of GARFIELD-AF registry data have shown that event rates persisted after adjustment for CHA2DS2-VASc risk factors and other key variables, including ethnicity, smoking, type of AF, and moderate-to-severe chronic kidney disease. Patients in North America were less likely to have a history of congestive heart failure than patients in Europe, Asia and Latin America. 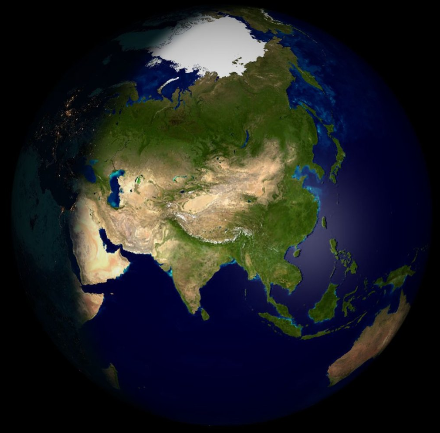 Patients from Asia with newly diagnosed AF were less likely to have a history of coronary artery disease or a history of bleeding relative to patients in Europe and North America. More data from a prospective analysis of patients with newly diagnosed AF in Asia treated with VKA therapy suggests that the lowest rates of stroke/systemic embolism and major bleeding occur at the INR level of 1.6–2.0.14 This does not contradict the regional practice of a lower INR than in non-Asian countries. Currently international guidelines for AF differ in their recommended target INR range: European and American guidelines recommend a target INR of 2.0–3.0, while the Asia Pacific Heart Rhythm Society and Japanese Circulation Society recommend an INR of 2.0–3.0, with a target of 1.6 – 2.6 for those aged 70 years and over. More data are required now to determine whether there are significant differences in outcomes among Asian and non-Asian populations. The first four months after a new diagnosis of atrial fibrillation (AF) have been seen to be the riskiest out of two years of follow-up following analysis of data from the GARFIELD-AF Registry. “These data indicate the importance of comobidities in predicting the risk of early mortality in patients with AF,” said Professor Samuel Goldhaber (Harvard Medical School and Brigham and Women’s Hospital, Boston, USA). This driving of mortality from earlier comorbidities highlights how a comprehensive approach to management must be adopted when treating AF. Patients should be given individualised care and put at the centre of the management planning. Studies are currently ongoing in various special groups of patients including a new study GALILEO, which is looking at the use of rivaroxaban-based antithrombotic strategy compared to an antiplatelet-based strategy after successful transcatheter aortic valve replacement to find out whether one is superior in reducing death or first thromboembolic events. This prospective, single-arm, multicentre study included 60 patients (median CHADS2 and CHA2DS2-VASc score ≥2), mostly with persistent, persistent longstanding or permanent AF, and no prior VKA or NOAC therapy. Overall, 81.7% were on rivaroxaban 20 mg OD (18.3% on 15 mg OD) for a mean of 46 days. In the modified ITT population (n=53), 42% had adjudicated complete thrombus resolution, and 60% resolved or reduced thrombus. These results suggest that rivaroxaban could be a potential option for the treatment of LA/LAA thrombi. 4. Connolly SJ et al. Andexanet alfa in factor Xa inhibitor-associated acute major bleeding. Presentation at European Society of Cardiology Congress (Hotline Preventive Strategies 2). Tuesday, 30th August 2016. 5. Coleman C, Antz M, Simard E et al. Real world evidence of stroke prevention in patients with nonvalvular atrial fibrillation in the United States: the REVISITUS study. Abstract: P2576. Eur Heart J 2016;37(Abstract Supplement):504. 6. Coleman C, Antz M. Real world evidence of stroke prevention in patients with nonvalvular atrial fibrillation. Abstract P2570. Eur Heart J 2016;37(Abstract Supplement):502. 7. Lip GYH, Keshishian A, Kamble S, et al. Is major bleeding risk for oral anticoagulants similar between nonvalvular atrial fibrillation patients newly initiated on warfarin and propensity score matched NOAC initiators? A real world study. Abstract: P2543. Eur Heart J 2016;37(Abstract Supplement):493. 9. Lin I, Masseria C, Mardekian J, et al. Bleeding risk for nonvalvular AF patients prescribed warfarin, or standard doses of apixaban 5mg BID, dabigatran 150mg BID or rivaroxaban 20mg QD in real world practice: Findings from HER. Abstract: 2065. Eur Heart J 2016;37(Abstract Supplement):402. 10. Friberg L. Major bleeding among patients with atrial fibrillation treated with rivaroxaban or warfarin in Sweden. Interim results from an ongoing post-authorization study. Abstract: 2067. Eur Heart J 2016;37(Abstract Supplement): 402–403. 11. Itainen S, Lehto M, Vasankari T, et al. Direct oral anticoagulants in atrial fibrillation patients undergoing cardioversion. Nationwide multicentre study. Abstract: 1355. Eur Heart J 2016;37(Abstract Supplement):235. 12. Banerjee A, Burnell J, Ryan R, et al. Real world persistence, adherence and switchover across anticoagulants in atrial fibrillation a national population based study. Abstract: 1351. Eur Heart J 2016;37(Abstract Supplement): 233. 13. Fox KAA, et al. Do baseline characteristics account for geographical variations in event rates in patients with newly diagnosed atrial fibrillation? The GARFIELD-AF registry. Abstract P4100. Eur Heart J 2016;37(Abstract supplement):801. 14. Goto S, et al. Vitamin K antagonist control for patients with nonvalvular atrial fibrillation in Eastern and South Eastern Asia: an analysis of event rates from GARFIELD-AF. Abstract P4971. Eur Heart J 2016;37(Abstract supplement):1007–8. 15. Goldhaber SZ. Presentation at Satellite Symposium ‘Practical dimensions of novel anticoagulant-based prevention of stroke in atrial fibrillation and management of acute venous thromembolism’. European Society of Cardiology, 29th August 2016, Rome, Italy. 16. Amara W. Presentation at Satellite Symposium ‘Practical management of patients with atrial fibrillation – individualized approaches to stroke prevention’. European Society of Cardiology, 30th August 2016, Rome, Italy. 17. Lip GYH, Hammerstingl C, Marin F, et al. Left atrial thrombus resolution in atrial fibrillation or flutter: results of a prospective study with rivaroxaban (XTRA) and a retrospective observational registry providing baseline data (CLOT AF). Abstract: P2569. Eur Heart J 2016;37(Abstract Supplement):501.